Due to the Christmas rush on couriers, our last day for online ordering is 11 December. We will reopen again 14 January so any orders received during this time will be sent the week the week of the 14 January 2019. 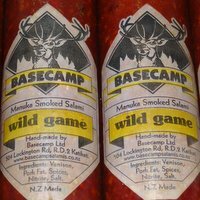 Basecamp’s venison salamis are very low in fat and cholesterol compared to other salamis. (Venison has a quarter to a fifth of the saturated fat of prime beef). The salamis do not contain gluten or any other meal or bindo type products. 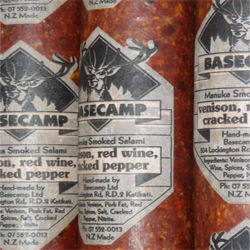 The salamis are all hand-made and sold per item. They weigh aprox. 1 kg before they go into the smoke-house. Made with cracked pepper, garlic and lots of chili. Made with juniper berry and game seasoning - no garlic and no pepper. 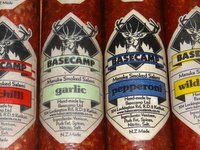 Buy any 4 Venison Smoked Salamis (Pepperoni, Garlic, Chilli, Red Wine Cracked Pepper, or Wild Game) from our range and save $10. Please ensure you select each item from the drop down lists below before adding to the shopping cart. This is our gourmet salami. The venison is complimented by the red wine giving it a distinctive flavour. Other ingredients include pepper and garlic. 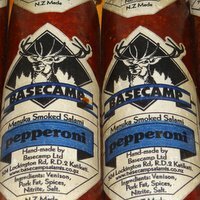 Basecamp’s beirsticks are made with venison only. They do not contain gluten or any meal or bindo type products. There are eight long sticks in a pack. Weight per packet is 200gms+. Contains pepper, garlic, caraway seeds, & parsley. Contains garlic, caraway seeds & parsley. 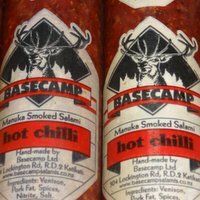 With juniper berry and game seasoning..
With chilli, pepper and garlic. Per kg. 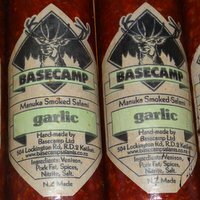 A high quality gourmet meat sausage, lightly spiced with pepper, garlic and parsley. Approx 12 sausages per kg. 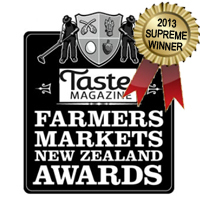 This sausage won the Farmers Market Award for Tastiest Food from the Butchery in 2013. Vacuum packed in 8's (1 kg) This is a thick meaty pattie that can be cooked from frozen. 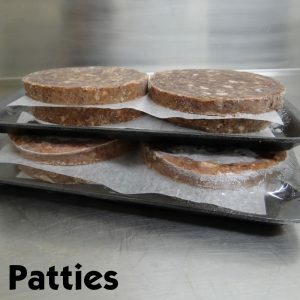 Heat your pan and cook pattie two to three minutes on each side. Best not to over cook.